It absorbs shock, anti-corrosion, excellent electrical insulation properties. It will not create sparks in explosive or flammable environments. Flexible shape according to the cargos, it's also very soft clinging or wrapping on the cargos and will never damage the cargos when working. It keeps operators from risk of injury. Avoid cutting by sharp tools in use of the round lifting sling. 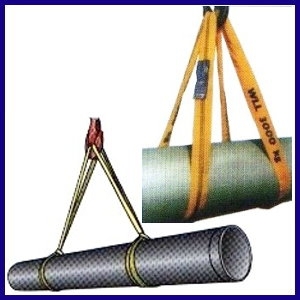 It's better to wrap up with leather or polyester to protect the round lifting sling for rough surface cargo which will extend its working life. Tie a knot or connecting with knots are forbidden. 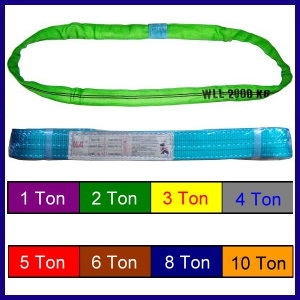 It is necessory to connect the round lifting sling by bridge piece. Length Item No. Item No. Item No. Item No. Item No. Item No. Item No. Item No.